Trauma to primary teeth can result in a wide range of disturbances to the underlying permanent teeth, such as dilaceration. Root dilacerations occur more commonly than crown dilacerations. This paper is a report of an 11-year-old girl with a missing maxillary left anterior tooth. Past history revealed premature loss of primary maxillary anterior teeth due to trauma. 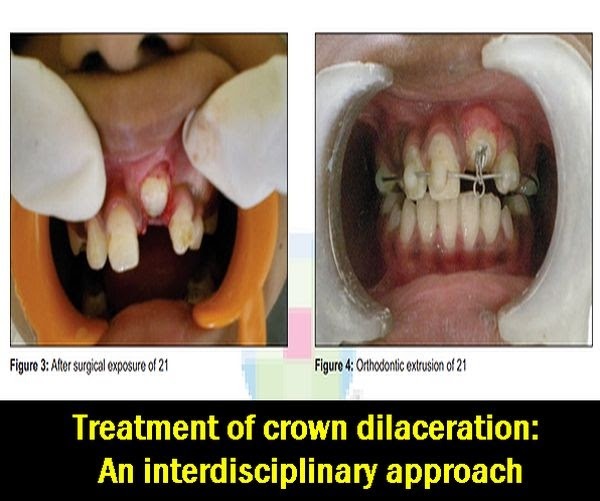 Radiographic examination revealed crown dilaceration of permanent maxillary left central incisor. An interdisciplinary approach in the management of this child is presented herewith. Injuries to the primary dentition are among the most common trauma found in the maxillofacial region. Thirty to forty percent of children incur at least one injury to their primary teeth and the incidence is not gender related. The close proximity of the developing permanent tooth germ renders it vulnerable to trauma transmitted during an injury to deciduous teeth. The type and severity of disturbance is dependent upon stage of tooth development, relationship of permanent tooth to the roots of primary tooth and direction and degree of force. Dilaceration constitutes 3% of the total injuries to the developing tooth bud. Dilaceration refers to an angulation or a sharp bend or curve in the root or crown of the formed tooth.